Remember Vernon Wells? Okay, so do we. 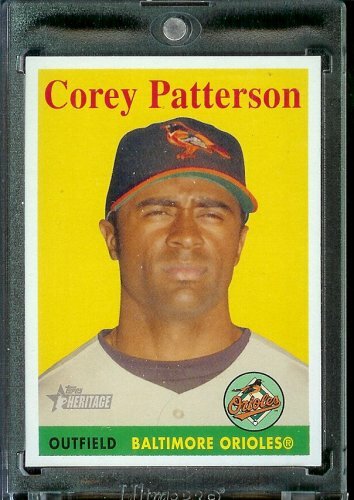 But Toronto Blue Jays centre fielder Corey Patterson is sure doing his part to help us forget the man who was at one point the highest-paid athlete in the city with an absolute monster of a weekend at the plate against the Chicago White Sox. First he mashed five hits and a walk-off homer on Saturday, then he followed it up with a four-hit effort on Sunday. Those numbers amount to sweet redemption for the 32-year-old, who turned from a once-prized prospect to a middling journeyman over the course of 10 long and rocky seasons in the big leagues. Corey Patterson was supposed to have many weekends like this one, games in which he’d be the best player on the field, a tantalizing mix of power, speed and defense. He had five hits on Saturday in Toronto’s 9-8 victory over the White Sox, including the game-winning home run in the 14th inning off Gavin Floyd, a low screamer that just cleared the fence in right field. It was just the seventh time in 30 years that a player had five hits and a walk-off home run in the same game. He added four more hits in Sunday’s 13-4 rout, including another home run. Before coming to Toronto this season, Patterson had proven little more on the baseball diamond than that he was unfazed by the sun. So when general manager Alex Anthopoulos signed him to a $900,000 minor-league contract, expectations were at a minimum. But batting second in the lineup (one spot ahead of some guy named Jose), Patterson has delivered in spades. Sure, he isn’t hitting 20 bombs a season just yet—but he also doesn’t cost $126 million a year. Rajai Davis is the starting CF for the Jays. Also, Corey’s seeing a lot of fastballs batting in front of Jose – hence the awesomesauce stats lately. Thanks for covering the Jays, but maybe fact check? Your comment is wrong. He is seeing less fastballs now then are his career norms, thus his current run cannot be simply explained by seeing “alot of fastballs”. Maybe you should check your facts. So yes, maybe Dave Zarum should do some fact-checking, or at least watch a little baseball.